a nature, wildlife, and photography perspective. Cowan's Ford Wildlife Refuge is a 668-acre peninsula bordered by the Catawba River. Located near Charlotte, NC in Mecklenburg county, the refuge is designated an Important Bird Area (IBA) by the Audubon Society of North Carolina. Entrance into the interior of the refuge is prohibited without proper authorization. The general public is limited to the entrance road (Neck Rd.) and the observation platform at the terminus of the road. All photos on this web page were taken from Neck Rd. or the observation platform. There are no restrooms on the premises. The only amenities are a couple of trash containers, two picnic tables, and the observation deck. 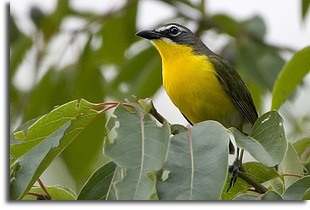 Birds and birding. Realize my current experience with Cowan's Ford Wildlife Refuge is from an early summer perspective. There were no wintering waterfowl in the two wetland impoundments in front of the observation platform. Though I dare say there probably are in the winter time. Cowan's Ford Wildlife Refuge is a small bright spot in a region known for uncontrolled development. The refuge is not necessary scenic. There is a power line right of way that cuts through the middle of the refuge. From the parking lot near the viewing platform, one can view the ominous Riverbend Steam Station across the Catawba River. But those two distractions pale in comparison to the noise pollution from aircraft. Apparently the refuge lies in a major approach (path/holding pattern) for jets entering Charlotte. If you do birding by sound the jets can be an aggravation. 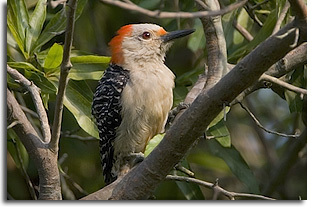 Still, the refuge offers a bounty of bird observation for the careful observer. 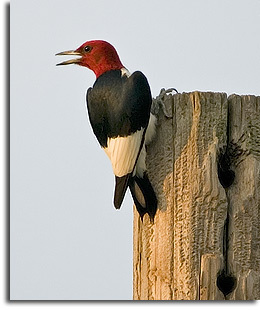 This birding environment includes upland and bottomland hardwood forests, mixed pine-hardwood forests, grasslands, and some shrub/scrub areas. The grasslands are located at the end of the refuge road. The shrub/scrub areas are located at the right of way for the power lines. I personally have not seen the bottomland hardwood forest and suspect it is located around what is known as 'Duck Cove'. Duck Cove is not accessible or viewable from the areas in the refuge open to the general public. The observation platform faces two wetland impoundments. These impoundments are a fair distance from the platform. Binoculars are necessary to view any wildlife near the impoundments. There is a bluebird house approximately 15-20 yards away from the front of the platform. At the time of this writing, there must have been chicks inside because I observed the male and female Bluebird entering the house frequently with food. 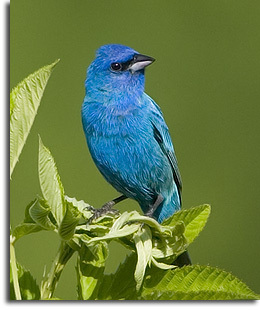 Occasionally an Indigo Bunting would land on the bluebird house. To the right of the vista from the platform is a standing dead tree where I have observed various birds perching including Bluebirds, Indigo Buntings, Kingbirds, and a Yellow-breasted Chat. 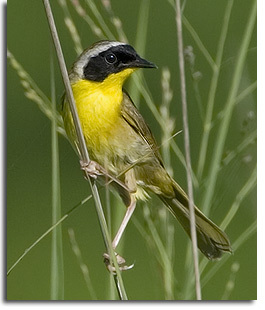 With somewhat less frequency, a Common Yellowthroat was sometimes observed milling about the grassland in front of the platform searching for insects. The large tree in the field to the right when entering the parking area appears to be a very popular spot for the birds and there is plenty of room for everybody. While birding this spot I have observed Red-headed Woodpeckers, Red-bellied Woodpeckers, a Bobwhite, a Summer Tanager, an Indigo Bunting, and a Common Yellowthroat in that tree. Though not all at the same time. 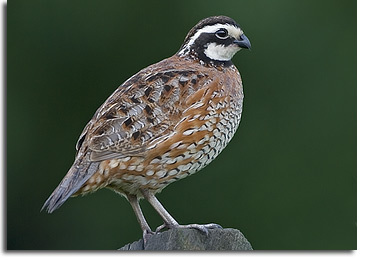 Note that the Bobwhites are generally heard and not seen. I was very surprised to see one in the big tree ... and even more surprised to see one sitting on the split rail fence one day. Birds observed on this particular early summer study (about 6 trips) include Yellow-breasted Chat, Blue Grosbeaks, Goldfinches, Field Sparrows, Red-headed Woodpeckers, Red-bellied Woodpeckers, Wood Thrushes, Great Blue Herons, Osprey, Yellow-billed Cuckoo, Brown Thrasher, Summer Tanagers, Indigo Buntings, Common Yellowthroats, House Finches, Bluebirds, Wild Turkeys, and Bobwhites. The only mammals I was lucky enough to see were white-tailed deer and cottontails. Birds are the main attraction at this location. There is no wilderness experience to speak of, though the refuge is not overly used and one can usually find some solitude there, though you can expect to see other birders passing through. Many species of birds inhabit Cowan's Ford Wildlife Refuge, though most are going to be viewed from a distance making photography somewhat difficult. I used a 500mm lens with a 1.4 tele-converter giving me an effective focal length of 700mm. This was still not enough most of the time and I relied on a heavy crop and photoshop to create the photos for this particular web page. Realize the photos were not shot in one outing. Some outings I would come back with no photos at all. All shots on this page were taken from my vehicle except for the Bluebird which was taken in front of the observation platform. From I-77, take Exit 23, go west over the interstate on Gilead Road (SR 2136). Follow Gilead Road for approximately 4 miles. At the intersection of Beatties Ford Road, make a left and continue on Beatties Ford Road for approximately 3.5 miles. Make a right onto Neck Road. Continue on Neck Road until you reach the refuge. I suggest you 'left double click' to zoom in for more a more detailed view. Note, clicking on the balloon markers does nothing. Cowan's Ford Wildlife Refuge - From Mecklenburg County Parks and Recreation. Cowan's Ford Wildlife Refuge ... a nature, wildlife, and photography perspective.